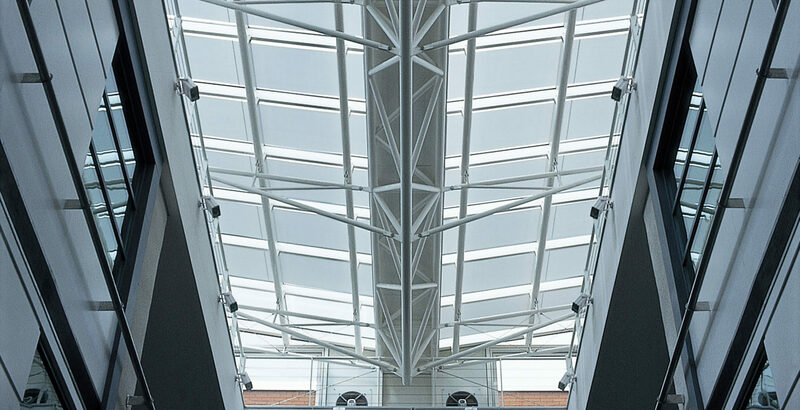 Solar shading improves the comfort of commercial and public buildings and helps to reduce energy consumption. This is especially true if considered at the planning stage of a new build or refurbishment project as this enables solar shading to be correctly integrated into the building. Blinds and shutters can help to reduce solar gain in the summer and heat loss in the winter. Harvesting light through the correct use of solar shading helps to naturally light spaces and reduce costs of artificial lighting. Controlling glare is often a key requirement of blinds and shutters especially as it is a legal requirement. Improving the comfort of buildings has proven benefits on the building’s occupants. For example improved productivity in offices, learning outcomes of students in schools and the speed of recovery of patients in hospitals. Solar shading allows for more glass to be used in building design as it provides an appropriate dynamic response to changing weather and light conditions whereas glass is static. Click the benefits below to see how solar shading can help you.